Tá scetimíní móra ar dhaltaí Rang 5. Tar éis seachtainí a chaitheamh ag obair ar a dtionscnaimh, tá said réidh chun iad a chur os comhair na ‘Dragons’. Cén ceann a roghnófar?? After weeks of work, the scene is set! The ‘Dragons’ are in school. 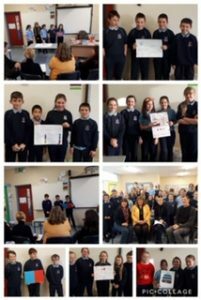 What project will be chosen to represent the school in this year’s JEP competition?